The forthcoming ‘Strictly Rhythms Vol. 9’ compilation features 27 exclusive new mixes from the likes of Subb-an, Yolanda Be Cool, Eli Escobar, Drop The Lime, Monkey Safari and many more, all carefully selected by Wax Motif & Neoteric. The Strictly Rhythms series is all about one individual’s vision of Strictly Rhythm, their personal choices of original tracks, reworks and remixes. 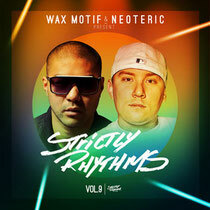 ‘Strictly Rhythms 9’ breaks into a new attitude with DJs, producers and scenesters Wax Motif and Neoteric. Their novel and unselfish vision was to act more as curators by spreading the love to their entire extended crew of fellow producers. The result is a collection of 27 classics (old and new) remixed by 25 different remixers. Every track is a brand new re-edit, rework or remix, from Monkey Safari’s take on Chocolate Puma and Bingo Players’ ‘Touch Me’ to Yolanda Be Cool’s remix of Erick Morillo’s ‘Jazz it Up’. Armand Van Helden, Roger Sanchez and Kenny Dope are among the original producers represented, but for added freshness, the players have taken care to unearth those buried gems: Subb-an choose Black Magic’s ‘Let It Go, Oliver $ goes for DJ Sneak’s ‘Keep On Groovin’’ while Drop The Lime tackles Ultraworld’s ‘Life After Death’. It’s out October 15.